Lisa Halsey of Jeff D'Ambrosio Chevrolet shows off a shadow box. 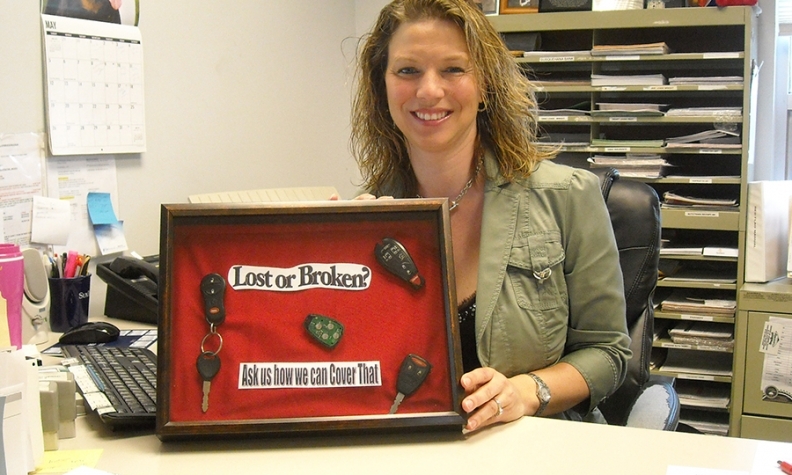 Shadow boxes make good props to introduce key replacement policies, says Lisa Halsey, business manager for Jeff D'Ambrosio Chevrolet in Oxford, Pa. Her dealership has a couple of the boxes on display in the showroom and outside her office. Intact and broken car keys are fastened to the liners of each box with the legend: Lost or Broken? Ask us how we can Cover That. "It does get people asking," Halsey says. "People do notice when they walk around the showroom." Jeff D'Ambrosio Chevrolet uses iPads to make video sales presentations in all dealership departments, says Lisa Halsey, business manager of the Oxford, Pa., store. In F&I, that could include presentation of paint protection policies, she says. "Lots of people really seem to like these videos," Halsey says. "You can explain features and benefits while people are waiting. This time of year, they can do that inside instead of freezing out in the parking lot."